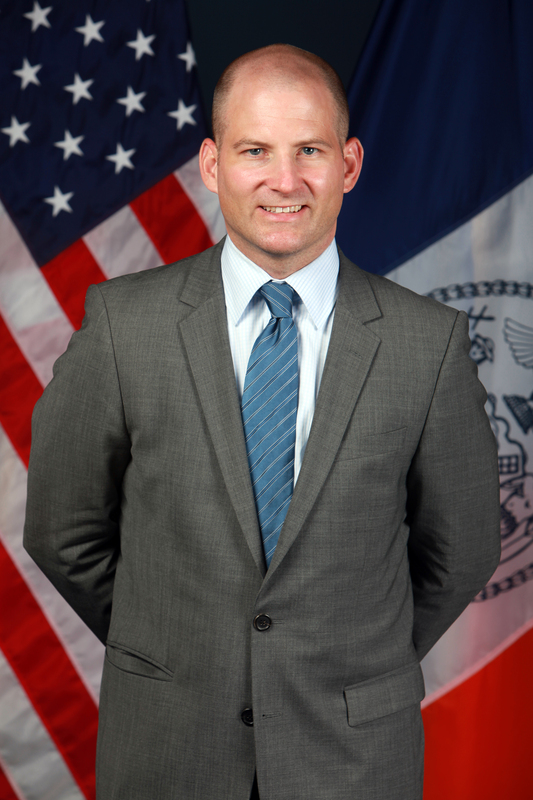 Cas Holloway, as commissioner of the Department of Environmental Protection, is responsible for protecting the City’s environment. This includes ensuring that clean drinking water from upstate aqueducts reach the City’s 950,000 buildings and that the City’s 14,000 miles of water and sewer mains remain in good working order. The agency also plays a major role in implementing PlaNYC by promoting the use of modern, “green” infrastructure. Holloway joined the Department of Parks and Recreation under Commissioner Henry J. Stern after graduating from Harvard College in 1996 with a degree in government. After spending a year generating private sponsorships for parks, Stern named Holloway as his chief of staff. Two years later, Holloway enrolled at the University of Chicago Law School, earning his law degree in 2002. He began his legal career as an associate at Cravath, Swaine & Moore and then served as a clerk for Judge Dennis G. Jacobs, now Chief Judge of the United States Court of Appeals for the Second Circuit. Holloway later joined Debevoise & Plimpton where he focused on corporate litigation and regulatory investigations. Holloway did not intend to return to the public sector anytime soon, but in 2005 received a “once-in-a-lifetime” offer to join Mayor Michael R. Bloomberg’s office as chief of staff to Deputy Mayor for Operations Edward Skyler, and special advisor to the Mayor. Holloway was instrumental in writing and implementing the Administration’s report on the health impacts of 9/11 and led negotiations on the related James Zadroga 9/11 health bill. He also played an important role in the implementation of the city’s 2006 Solid Waste Management Plan. Mayor Bloomberg named Holloway commissioner of DEP in January 2010. Stormwater solutions. The City’s NYC Green Infrastructure Plan provides a framework for achieving the twin goals of better water quality in New York Harbor and creating a sustainable New York City by combating the problems associated with the City’s antiquated combined sewer system which collects sanitary sewage and stormwater runoff in a single pipe system. As little as one-twentieth of an inch of rain can overload the City’s system. This combined sewer overflow dumps 27 billion gallons of untreated sewage annually into the City’s waterways. Major components of the plan include building cost-effective stormwater detention facilities and catch basins, and controlling runoff from ten percent of the City’s impervious surfaces using enhanced treepits, bioswales, and green roofs. According to Holloway, this approach to stormwater management would reduce overflows by roughly twelve billion gallons per year and would save close to $2.4 billion over the next 20 years. Holloway points out that recent projects, such as the new 50-million gallon Paerdegat Basin detention facility, can reduce but not eliminate overflows entirely. Holloway notes that green infrastructure offers additional benefits including improved air quality, diminished heat-island effect, and tangible community improvements in the form of aesthetically pleasing installations. Holloway says that the City’s right-of- ways, including streets and sidewalks, present the greatest opportunities for green infrastructure due to the low cost of installation in such areas. DEP has partnered with the City’s Department of Design and Construction to place bioswales in existing road projects, and with the City’s Housing Authority to retrofit green elements into a housing complex. The City needs DEC approval to finalize the NYC Green Infrastructure Plan. Private opportunities. DEP is pursuing public/private partnerships to ensure that sustainability remains a priority for future administrations. Holloway explains that the successful implementation of the NYC Green Infrastructure Plan depends on public involvement and private investment. The City cannot invest directly in private infrastructure, but it can fund projects that assist in meeting a public mandate. To that end, DEP’s recent Green Infrastructure Grant pilot program allocated $3.8 million in community grants for proposals designed to improve water quality. Holloway says that similar grant programs are forthcoming. Ongoing operations. DEP’s operations and capital investment plan, known as Strategy 2011-2014, includes 100 specific initiatives to provide clean water, fresh air, and a sustainable environment for New Yorkers. One major project is the completion of the second stage of City Water Tunnel No. 3. Under construction since 1970, the tunnel is expected to cost $5.5 billion when complete. Its operation would allow for the inspection and repair of City Water Tunnels No. 1 and 2 for the first time since they entered service in 1917 and 1936, respectively.